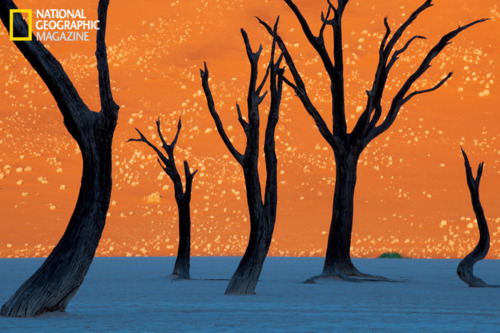 Frans Lanting’s image of camel thorn trees gracefully back bending and saluting the sun as it rises against sand dunes in the Namib desert is beyond gorgeous. Not to mention mind-blowing. This surreal, haunting, joyous image is not, as your brain might try to argue, a painting, but, in fact, a photograph. It’s so fantastically pleasing to the eye that its materials are irrelevant. But the fact that this is a photograph makes me love it – and our crazy-awesome planet – even more. The internet says this photo, along with other stunning Lanting pics, will appear in National Geographic’s June 2011 issue.